Pope Francis on Tuesday concluded his Apostolic Visit to the United Arab Emirates. “I don't know how to thank you.” Pope Francis said to the Crown Prince for the invitation to the United Arab Emirate. The Pope then shook hands with each one of the members of the whole group from the United Arab Emirates. Mohammaed Bin Zayed, did the same with the representatives of the Vatican who accompanied the pope. Pope Francis presented the Crown Prince a gift before exchanging goodbyes from the entrance of the plane. On the red carpet, the two walked together. 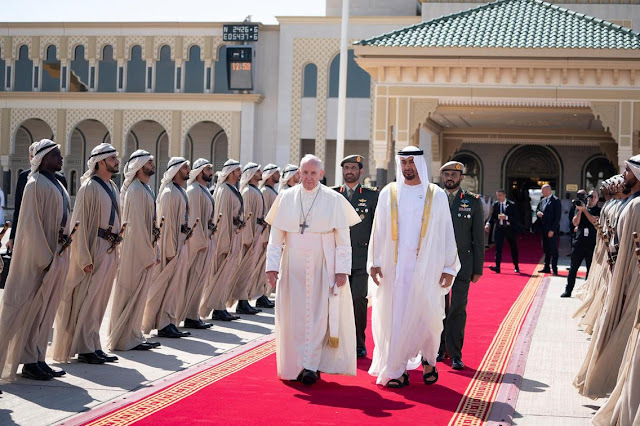 Earlier in the day Pope Francis visited Sheikh Zayed Mosque in the United Arab Emirates. The pope arrived by car, and Imam Ahmed Al-Tayeb went out to meet him. He is the spiritual guide of 1,100 million Sunni Muslims and the great Imam of Al-Azhar University. In this mosque, Pope Francis visited the tomb of the founder of the United Arab Emirates, Zayed bin Sultan Al-Nahayan. Then the Holy Father had a private 30-minute meeting with the Muslim Council for the Elderly. According to the Vatican, they highlighted the importance of the meeting's culture to reinforce their commitment to dialogue and peace. The Sheikh Zayed Mosque is the largest in the UAE. It takes up more than 215,000 square feet. Promoting peace and good relations. Thanks for sharing.